California's Inland Empire was hit hard by the 2008 crisis, with disproportionate foreclosures on poor and working-class families, leaving neighborhoods blighted by empty, vandalized homes. But then a funny thing happened: the rents in these blighted neighborhoods started going up and up and up, so that now 63% of tenants are paying 30% or more of their income in rent (33% of tenants are paying 50% or more). The soaring rents are the results of a cornered market: the houses in San Bernardino were snapped up by Invitation Homes, a division of the Blackstone Group, the world's largest hedge fund. Blackstone is at the center of a national epidemic of high rents, and is financializing tenants by creating bonds based on their rent payments. 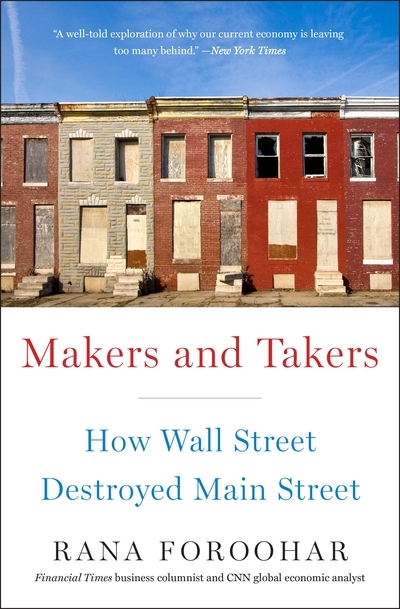 The story is told in Rana Foroohar's Makers and Takers: How Wall Street Destroyed Main Street, just publishing in paperback, in which the Financial Times associate editor describes the way that financialization undermines productive economic activity and replaces it with casino capitalism to the benefits of financiers and the detriment of the world.